Word Crumble – Connect Word All Level Answers, Cheats, Solutions for iPhone, iPad, iPod Touch, Android, Kindle, and other devices with screenshots for you to solve the levels easier. This game is developed by Wen Gong. Word Crumble – Connect Word is the most popular word finding game. Find hidden words by swiping across the letter blocks and improve your vocabulary and spelling skills. 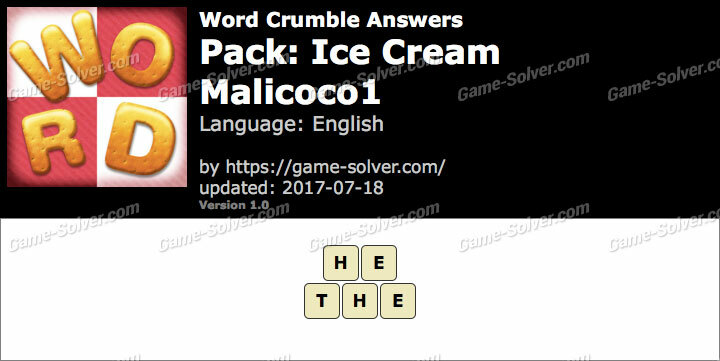 These are the Answers for Word Crumble – Connect Word Ice Cream-Malicoco1 with Cheats, Solutions for iPhone, iPad, iPod Touch, Android, Kindle, and other devices with screenshots for you to solve the levels easier. This game is developed by Wen Gong.